The Department of Philosophy and the Lyceum Club at Southern Illinois University Edwardsville will host the 13th Annual Undergraduate Philosophy Conference October 12-13. Nine schools in total from across the country will participate in the conference this year with distinguished scholar and keynote speaker Lisa Downing of Ohio State University. Downing, who chairs the philosophy department at Ohio State University, received a from Ph.D. Princeton University and previously taught at the University of Illinois at Chicago, the University of Pennsylvania, and Yale University. She has published numerous papers on early modern philosophy, drawing from connections between philosophy and natural philosophy during the seventeenth and eighteenth centuries. “The scientific revolution is also a revolution in philosophy,” Downing said as she pointed out that individuals like Sir Isaac Newton were not only scientists of their time, but also philosophers whose ideas were heavily criticized and debated. 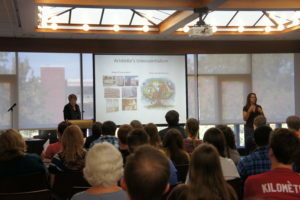 The conference at SIUE gives students from around the country a venue to present their ideas to professional philosophers like Downing and share in dialogue surrounding numerous areas of philosophical interest. “Students have the opportunity to present their ideas to the public and receive feedback from students and professional philosophers alike,” stated Assistant Professor of Philosophy and Faculty Advisor, Richard Fry. The Undergraduate Philosophy Conference is free and all who are interested in Philosophy are encouraged to attend.